A saddlebred to share with you! I enjoy looking at all the youthful talant here...good job! Many of my pieces looked a lot like your when I was young. 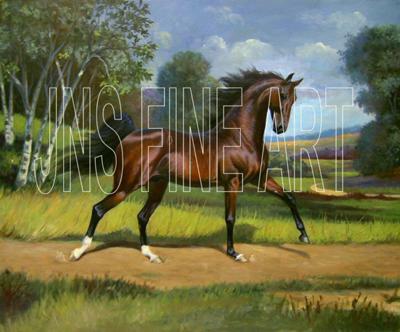 I've been drawing and painting horses for over 40 years. Lots of practice makes perfect! Keep up the good work! Comments for A saddlebred to share with you! Holy horses! That horse is gorgeous! Great job!..... Sorry I forgot your name. It's true, practice makes perfect, don't stop drawing NO MATTER WHAT! Take a look at my art if you will post a few comments and tell me what ALL OF YOU think. That is awesome it's beautiful I'm 13 I've been drawing a while but I'm nowhre near that good yet I really like your work...! She does a great job doesn't she? But she also practices a lot. So keep working on it and share some of yours with us! wow I love it! I draw too..
Gosh you're good. Just as well you are a professional or! that is just wow!! great job on that!!! Hi! I used oil paint on a canvas 24" x 30". I like to put on extra gesso and when it's dry, sand the surface real smooth before I paint. It makes the finished painting real smooth! Thank you Windcall! Yes, I am...have been painting and drawing horses for almost fifty years now. Most of what I do is oil on canvas. I have been enjoying seeing all the young up and coming talent here and encourage all the guys and gals to practice, practice, practice! I'm more into writing than drawing, but I have made a few sketchy attempts with horses. Are you a professional artist? Again, I have to say, this picture is just beautiful! What did you use? oil paint? PAiNTER? Photo shop?